Ships' Figureheads is a story of the carved wooden bow decorations that once adorned almost every stem of a ship in a time when sea traffic took place exclusively in wooden ships and under sail. It begins with a report on the mythological origin of the decoration, and then continues to show the development of figureheads from the Polynesians, Phoenicians, and Vikings to the high point of the gloriously decorated Renaissance and Baroque ships. Then it moves on to the imaginative variety of the figure-heads of the 18th and 19th centuries that are still in use today. This informative, well-documented read is the result of an inclusive international documentation project of nautical historians Hans Jurgen Hansen and Clas Broder Hansen. It's filled with some 100 illustrations to show the variety of figurehead types and includes 32 pages of large colored photos that show their beauty. It evokes the romance that once was linked with them when they looked down from the high prows of sailing ships at the foaming sea below. 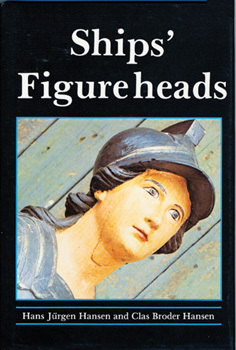 Ships' Figureheads is a must read for not only those interested in Figureheads but any nautical enthusiast.